It’s “the unspeakable in pursuit of the uneatable”, like some traditional yet tawdry legislative fox hunt. No quarter asked, none given, with the polity being none the wiser which the lesser of the two evils is. (All right, we have some idea the UNFFGG is ahead by a fox’s hair; that much is clear.) 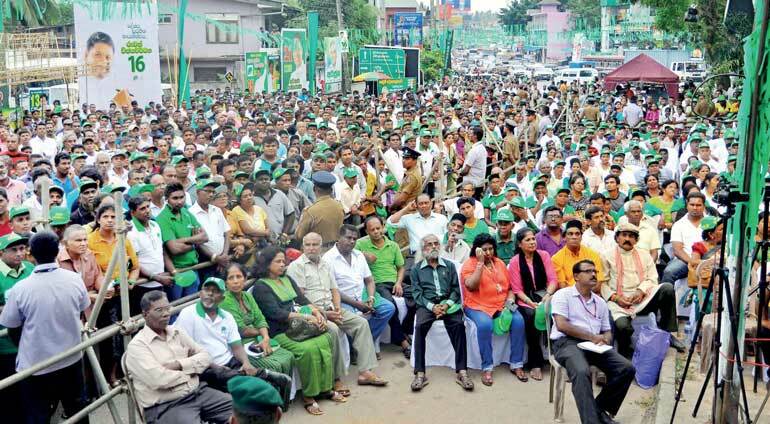 Is it the UNP in ‘hunter’ mode – a rather ruthless and remorseless one in the past week or so of electioneering – flushing out a pestilential parasite that impresses some of us the most? Or is it the ‘hunted’ ex-strongman of the UPFA himself, a wily if evidently rabid fox determined to return to its rotten borough (sorry, burrow) to wreak more havoc? Which hunt, in itself, might be a development – or a devilish witch-hunt – with much commentary to be made by bystanders. Such as that while the common or garden citizen (like you and I) may be hoping for *A New Society*, most politicians are still stuck in the rut of ushering in *A New Political Culture*. Ugh, theirs. Um, and by ‘new political culture’, they mean winning the election – not transforming the nation. Not by any stretch of the imagination. If the propaganda war being fought right now is any gauge of the main contenders’ motives, their greatest ambition is getting back into or staying in power. ’Twas ever thus! Eh, if country conditions and indicators improve by the way, why, that’s a bonus. Be that as it may, we’ll promise the sun, moon, and stars... even if we’re a little evasive about the budgets for the <bridges across forever> we’re building. Maybe we’re being unfair by a handful of sincere big-picture nation-builders, but it doesn’t pay for the electorate to be naïve when there’s more than one’s (someone else’s) parliamentary seat riding on the outcome. It’s your funeral or your fun times, and mine, that’s at stake; not some hidebound gerrymander’s political career. It’s WHO people are, or SEEM to be, or are SHOWN to be, that counts – not what THEY STAND FOR in big-picture terms. There are some principled politicians who are asking the electorate – and themselves – the tough questions. True. But thus far, and no farther! If the answers to questions like ‘Who is he? Why vote for him?’ yield sorry platitudes and precious little political will to follow through, because of party ties and personal loyalties, more’s the pity. More. Is. The. Pity. It’s still your future and mine that’s on the line. Who ARE they? What ARE they doing? So a majority (many, if not most, if not all, save a few good men and women) are maintaining engagement at the level of petty quibbles, partisan squabbles, and political one-upmanship. Sadly, the choice of candidates based on the solidity of their plans, the sincerity of their principles, and the strategic nature of their manifest policies and promising manifestos is pretty thin on the ground. We’re being asked to choose between alleged murderers and ambitious manipulators; between Mafia-family style nepotism, or Marketplace white-collar cronyism; between psychotics and sociopaths on one hand, or narcissists and those with severe personality disorders on the other. Do people get the parliaments they deserve, or do elected MPs get into parliament because they deserve it and we them/they us? Then, there are those who won’t – or don’t – or can’t – take a broad hint... But, to be fair (and democratic, etc, and all that jazz... which doesn’t always end well for the commonwealth – bar the corrupt with their reputations to lose), if it was anyone else seeking another chance to “serve the people”, not so many republicans would be crying foul about “self-serving opportunists serving oneself”. It is simply that we know our politicos better than they know themselves, or care to self-appraise. Today, some of the bastions of democracy have been re-erected in such a surprisingly short time so as to bulwark even the most egregious claims to re-election. Even if these claims are on the most spurious grounds of imagined threats to national sovereignty, or the spectre of separatism giving rise to chauvinistic responses that favour ultranationalists in the hustings as much as in the House. But as long as the likes of the ex-mouthpiece of the JHU – that erstwhile minister, high panjandrum-in waiting, and erstwhile crier of “Tiger! Tiger!” – is running with the hares and not hunting with the hound, we know that this Eelamist straw man is only (or mostly) a spectre conjured to scare the witless and woo and win the spineless. What’s the state of play? In the meantime, significant gains have been made in the state of the nation and the proper separation of powers, in the shortest span available to any cobbled together cabal to make good on manifestoes and election promises. The judiciary is looked up to, not down at, and has enough dignity now not to have its arm twisted or its justices strained or constrained to dance to the chief piper’s tune. The long arm of the law is not foreshortened, though at times it still seems to be on its new masters’ leash. The apparatus of state (save the media of state) is apparently no longer in thrall to its political puppet-masters, if only slightly indebted to the incumbents by virtue of gratitude and the guilt-and-shame culture that pre-empts bureaucrats from being too rebellious against any given regime. The Elections Commissioner has acted independently and impressively, or has been seen to have acted, and with some degree of instrumentality previously absent. So, you’d have a good idea of how things have changed from a shadowy half-life under a despotic regime to a more abundant life under a democratic republicanism. I’m trying to say that if the Rajapaalakayas had been in power, Ranil & Republican Co. would have had an uphill, unfair, unwinnable fight on their hands. As it is, despite the downright dirty tactics adopted by some of the more thuggish Greens (ruffians’ red-blooded excess is not the exclusive bailiwick of the less savoury elements of the opposition), it is a free and fair and die hard fight to the bitter end. So free and fair that not only are the incumbents not abusing or misusing state machinery – at least, not to the extent and the intensity that their predecessors did – they are giving their political opposition an advantage by fighting relatively clean. Despite the occasional wobble when incumbent ministers’ doubtful but dubiously lingering connections to the underworld are ostensibly brought into question. But wait. Is the opposition serious about those allegations, leave alone their verity? Let those who are without sin cast the first stone, verily we say unto thee! Let those who have an iota of intelligence and information at their fingertips feel free to reason and arrive at a veritable conclusion. A former strongman’s past promise to eradicate corruption in his putative third term a while ago, for instance, is as credible as his present undertaking to investigate an ‘accident’ that has now been revealed to be an ‘assassination’. Oh. Why now? What then? With that said, the Thajudeen saga tends to leave a bad taste in the mouth of those desiring A New Society, not simply A New Political Culture. It has gone from being “a riddle, wrapped in a mystery, inside an enigma” to being the issue over which one coalition or another might lose its deposit at the poll – to say nothing of the positive regard and proper respect of the people it has terrorised or traumatised. The writing is on the wall. The timing of the investigations and the revelations are as suspect as the commissioning and the carrying out of the crime. The solutions to the crime are as evasive as the law enforcement agencies have been effete and enthusiastic, in turns. The energy being put into leveraging the case by parties of both parts is designed to woo the voters, but may leave much of the electorate weary and worn out at the petty games politicians of all shades play (and feel they must play) to retain their seats, majorities, preferences, and the affections of the masses. Ah. But of course folks, this is Sri Lanka – a land like no other: as the optimists say. Or, if the pessimists about human nature are right: a land like all others. Or, to give the realists their fair shout: a land like some others with the chance to change. How good does it get? In years gone by, say the past decade or so, elections were a rather one-sided affair. The then incumbent regime had just won an unwinnable war and it seemed that a grateful electorate would forgive them just about anything. It was not to be a sentiment that lasted long enough for the liking of the kith and kin, cronies, and country bumpkins become royal courtiers who were having OUR cake and eating US out of home and country. That it ended in tears was no surprise to historians who remember that polities will eat bread and stomach circuses for prolonged periods in times of war, but will want their fill and share of the national wealth once wars are won. When people wake up to the fact that castles in the air won’t feed the family (except the first family and a few courtiers) any more than national pride will pay the national bills and staunch the national debt (while the national pride was sold and squandered for a song), that’s when the whole edifice starts to crumble. There is a limit to the most craven and cringing gratitude, and it’s a line that’s crossed when Operation Corruption becomes Organised Crime on an institutional scale. Thus, to any discerning voter – or patriot – or citizen with a development agenda – or person yearning for peace with justice and desiring stability with security and sincerity – it certainly looks as if it’s “all systems Green”: the only way to go forward from here. The cynical or strategic view is that the lesser of the two evils (I use the term lightly of the latter incumbents and seriously of the former regime) is the need of the hour for the long to medium term. In the long term we are all dead, anyway; and if the ex-strongman’s party comes in with a mandate that smacks of a majority of the people preferring the ‘yoke’ again to the ongoing ‘yahapaalanaya’, we might be dead in the short to medium term, anyway. So Green it is, with a clutch of red flags. For better or for worse, the opening up of the Thajudeen case was a grave red mark against the incumbent administration. To be fair by the powers that be as well as the police, it might be “happenstance” that the IGP entertained doubts about the veracity of the reports just at the instance that it might be most useful as political leverage. To be fair by the UNP, it may just be that the state media going to town over the ‘murder disguised as a mischance’ motif is “coincidence” and not tactical timing. That said, it is “enemy action” when media, social media, mainstream party political, and the kitchen sink reek of the ‘assassination, not accident’ leitmotif. Even the staunchest defenders of the UNFFGG baulked more than a bit at the prospect of the gory saga being used to gain traction albeit against an ogre that was state power and the stranglehold a few had over the many back in the dark ages. BUT: While it was good politics, it was not great to behold. What is next up their sleeve? Or will the fuss and bother over ghosts of murders past die an all-too natural death, once the election results are in? We hope not. The less said about it the better, perhaps? Maybe: Because just about everybody who is anybody major in politics today is doing it! But that makes it merely doable, and neither defining of principle nor desirable in practice. What, for instance, will be the price the polity pays for the concatenation of ‘good governors’ who were once ‘bad’ or ‘ugly’ if their new running mates win big? Will we have ministers of state who were once manifestly part of egregiously bad governance? Would that be good for us, or them? Can the leopard truly change his spots because his party card now says UNP and not JHU? Need I mention that a gentleman’s word is his bond, his guarantee of doing what he said he would? Need I remind you that a bond scam can be even the most honest gentleman’s undoing, if the word he gives – or fails to give – is not as honest as we would expect? All we ever asked for was an admission that there was a conflict of interest at least. All we ever got from the upper echelons was sophistry and sophisticated arguments that they were right all along. At least from my point of view, the alternative – if it is any real option at all – although in the best traditions of the democratic-republicanism we have championed and savoured and enjoyed, it is a possibility – must be eschewed, sequestered, contained. The prize we seek urgently is A New Society, even though the penalty we may pay for desiring it might be merely ushering in A New Political Culture. That is to say, one naïve or at best pragmatic coalition (UNFFGG: the lesser of the two evils) replacing another nightmare of possibilities of a coalition (UPFA: the greater of the two necessary evils, for that is what government generally is). With that said, the balance – at least among readers of this journal, methinks – can only be tilted in one direction for those desiring democratic-republicanism as we have experienced it (warts, scams, denials, excuses, chickening-outs, and all) to continue, to thrive, to survive; so that we can hope. In the end, one can only hope against hope that the rest of the electorate – by design or by default – has been able to taste, ingest, stomach, and retain all the points (even the propaganda) that has been spewed out by the Good Governance machine with its credible appeals to pluralism, accountability/transparency, and concrete plans for sustainable economic prosperity. It is a far better and a far healthier alternative to the tripe that the warmongering, weather-beaten, woefully passé, patriotism-touting, nationalism-shouting, sovereignty-thumping Strong Government camp has been dishing out. So say we all. OK, so say an estimated 51 percent (at the last count) of us. The discerning majority. That’s a good start. As long as you, dear voter, don’t expect a sea-change into something rich and strange (all murders solved! all scams admitted and ameliorated! all culprits brought to book! ), you’re safe with the signal that it’s all systems Green – and good to go in the short term at least. At least, even if we never find out who tortured, killed, and abducted Wasim, Lasantha, or Prageeth, we’re sure (well, fairly sure) that it won’t happen again under the rule of men who truly think that the loud clicking of a penman’s mouse is mightier than the subversive click of a deadly silencer or sharp end of a stick.